Janice Woodsen has been a writer with a focus on nutrition and medical articles since 1997. She was senior editor for the "People's Medical Society" and has professional affiliations with the American Dietetic Association and Arizona's Center for Integrative Medicine among others. Woodsen earned a bachelor's degree in journalism from the State University of New York. Mincemeat or minced meat, is meat that has been finely chopped and separated. This is the same technique used in ground meats. Usually the meat is run through a grinder that cuts and separates the meat fibers and then is run through several more times for a tender ground meat product. Minced meat is used in many dishes, such as pies, which are usually accompanied by spices and sweet fruit, like raisins. Chili, tacos and burritos are other dishes that use minced meat. Since the meat has been separated, cooking time is significantly shorter and can be done in a microwave. Defrost or thaw the meat. This can be done overnight in the refrigerator, in about an hour in the sink under lukewarm water or in the microwave. When defrosting in the microwave, make sure all packaging is removed from the meat. Refer to the manufacturer's manual for instructions on defrosting time and settings. Place in a microwave-safe container and set on defrost. Check to see if the meat has been fully thawed by plunging a spoon into the meat. It should penetrate to the center effortlessly. Add more time if necessary. Add any desired seasonings to the meat, such as salt, pepper and garlic. Mix the meat and seasonings well by hand or with a spoon in a mixing bowl. Set the microwave to high. There is no definite time for cooking meat in a microwave. Microwaves tend to cook meat unevenly and different cuts of meat may take different amounts of time to cook. A fatty meat will take less time to cook than a lean meat. A safeguard is to pull the meat out every 2 or 3 minutes and stir and crumble to ensure the meat is cooked evenly. This may need to be done several times during cooking. 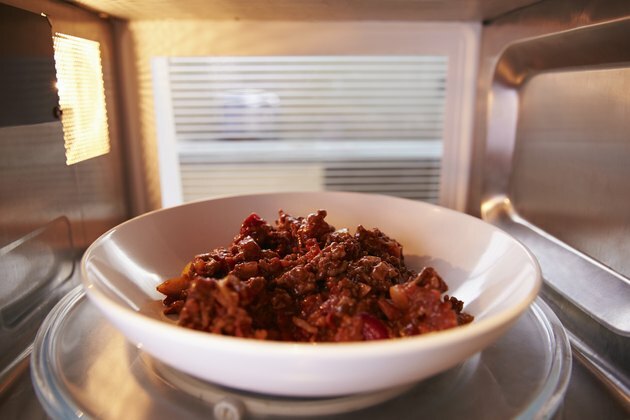 Keep a close eye on the meat while cooking, because microwaves can sometimes be unpredictable and may cook more quickly or slower than expected. The key is to check the meat every couple minutes.